These dishes and recipes are presented to you in the order which you might eat them during a four course meal. So consider this a huge banquet of some of France's most popular foods and be sure to leave room for some famous French desserts. Along the way you will find photos and links to some of the recipes on Easy French Food. They have all been tested by the chef (that would be me), and are purposefully simple so that you can get to the good part - enjoying your food! Gougères - These are bite sized cheese puffs made from choux pastry. Rillettes - Variously made from chopped fish, pork, or other meats that have been slowly cooked and seasoned, these are served spread on pieces of toast. 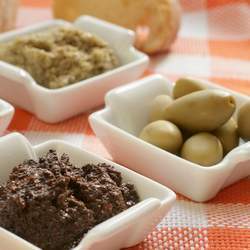 Tapenade - A puree of black or green olives, capers, and olive oil that is used as a spread. Now you are at the table. Remember that according to French etiquette you should keep your hands in sight at all times. So no folding them in your lap. Baguette - A long skinny loaf of French bread that is served with the entrée and will stay on the table until dessert. No French meal is complete without it. France runs on baguettes! Cuisses de Grenouille - Despite the myth of the French love for frogs' legs, they really are not number one on the menu and are only occasionally part of a meal. 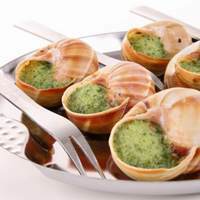 Escargots - Another famous French food that is not nearly so popular as has been rumored, but yes, the French do eat snails. 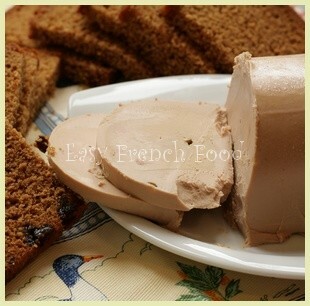 Foie Gras - This is the very fatty liver of a goose or duck that has been force fed rich grains. Enjoyed with plain toast or as part of another dish. Quenelles - These are sort of like a dumpling, but log shaped. Made from flour, milk, eggs and many times various meats or fish. 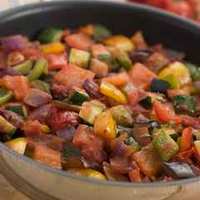 Ratatouille - A mix of sauteed vegetables, including eggplant, zucchini, tomatoes, bell peppers and onions. Salade Niçoise - This salad is so substantial that it can be enjoyed as a main dish. Recipes vary, but typically include tuna, tomatoes, bell peppers, and anchovies along with lots of olive oil. Truffes - These famous black mushrooms are so expensive and so tasty, that they are typically used in small quantities to accent another food. Time to dig in to the main course. You have a lot of choices when it comes to famous French food. Andouillette - A sausage made from chitterlings (that is a cute word for pig intestines). Blanquette de Veau - Veal that is cooked with carrots and onions and then served with a white, cream sauce. Boeuf Bourguignon - Beef cooked in red Burgundy wine, usually with mushrooms and carrots. Boudin Blanc - A white sausage typically made from pork, milk, onions and seasonings. Bouillabaisse - A richly flavored seafood stew made with olive oil and many different kinds of freshly caught fish. Brandade - Cod fish is pureed, seasoned, and maybe mixed with milk or potatoes, then baked to make this casserole. Cassoulet - A very hearty slow cooked dish of white beans and various meats, maybe duck confit or sausage. Choucroute Garnie - You may know this as sauerkraut. Cabbage is fermented for several weeks, then cooked with sausages, meats and potatoes. Confit de Canard - Duck confit is made by cooking the duck in a big pot of duck fat. The result is incredibly moist and flavorful. Coq au Vin - A famous food that is simply chicken (it used to be a rooster) that is marinated and cooked in wine. Fondue - Famous fondue Savoyarde is a big pot of melted cheese. Served with bread, potatoes, apples, and other things good for dipping. Moules Frites - Mussels and French fries are a popular dish in Bretagne (Brittany). Pot au Feu - Slow boiled beef and vegetables. 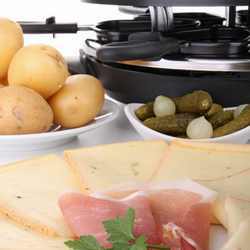 Raclette - Slices of cheese are melted at the table on a special dish and served, like a fondue, with bread and other things. Steak Frites - Steak and French fries are said to come from the north, and possibly Belgium. You can order this famous food just about anywhere in France. Tartiflette - A hearty dish of potatoes, bacon, white wine and reblochon cheese. Oh, you thought you were ready for dessert? No, first you must have some cheese. And with something like 500 different kinds of French cheese, you have quite a choice. Here are just a few of the more popular. 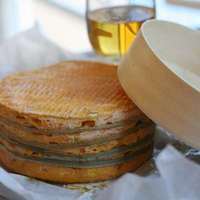 Brie - This famous French food is perhaps even more popular outside of France. It is named after the area in which it is produced, not far outside of Paris. Camembert - Along with the baguette, one of the most popular foods in France. 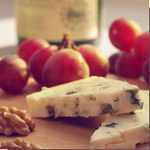 Roquefort - A strong tasting blue cheese? Not only is this one of France's most famous cheeses, it is also one of the oldest. Clafoutis - These are simple baked custards that include different fruits. The most popular version is made with cherries. Mousse au chocolat - Chocolate mousse. Everyone knows this famous French food, don't they? Créme brûlée - A cream dessert that is topped with hard caramelized sugar. Eclairs and Profiteroles - These are treats made from choux pastry, a special sort of dough made with lots of eggs, flour, water and butter. 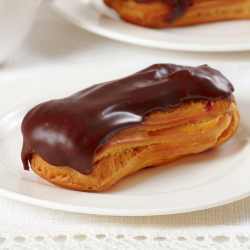 An éclair is log shaped, filled with pastry cream and usually topped with chocolate. A profiterole is round and typically filled with ice cream. 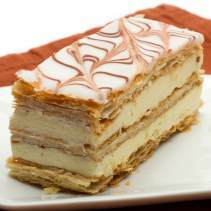 Mille feuilles - Several layers of puff pastry, typically filled with pastry cream. You might know these as Napoléons. Tarte Normande - France is not short on famous apple tarts. This one typically includes a little shot of Calvados, an apple brandy made in Normandy. Tarte Tatin - An upside down apple tart that was supposedly first made by the legendary Tatin sisters. Go from famous French food to French Foods. Or get started making your own with one of these Easy French Recipes. Here are a few things that are definitely on the Famous French Food List but do not fit in with our four course dinner. 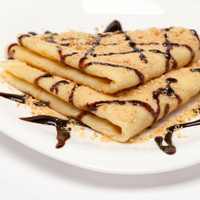 Crepes - Thin pancakes that are filled with both sweet and savory fillings. A special crepe, called a galette, is made from buckwheat flour. Croissants - Made from buttery layered pastry, these are typically eaten for breakfast. The French tend to save them for a treat on Sunday morning. Madeleines - These are sweet tea cakes that are shaped like a scallop shell, made famous by the author Proust. Please do not think this is an exhaustive list of famous French food. There are so many wonderful dishes from all around France that it would be impossible to limit ourselves. 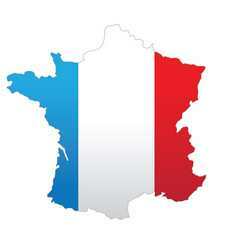 If you love French food and want to learn more, that is what this website is all about. So, please have a good look around.